Everyone will grow old, and our eyesight will also grow weak as time goes on, but we are still eager to use our eyes to feel our living environment, explore our world more clearly. Aged still can create huge social value for human. 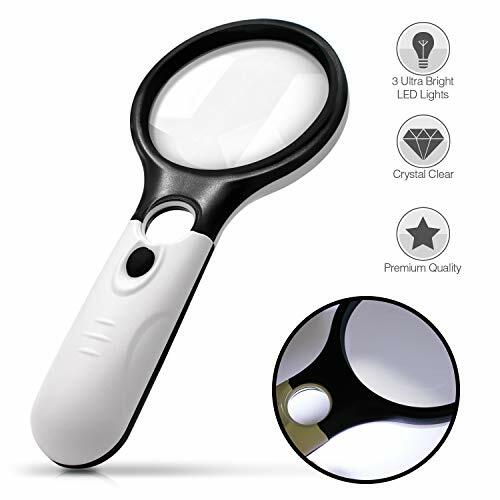 And SIKEMAY LED lights magnifying glass is the best gift to the aged, 3X and 45X magnification, imaginative unique LED lighting design are great to meet the requirements of olders. Comfortable ergonomic handle Switch to turn lights on and off Compact and stylish design, portable light weight Great for reading, circuits, jewellery evaluating, and etc. Please contact our customer service if there's any question. Not satisfied? Please don't worry, return of goods is 100% guaranteed.